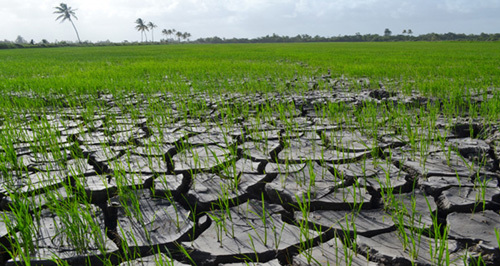 After a few wet months, Guyana is bracing for a dry period, authorities warned yesterday. Farmers are being advised in the coming weeks to carry out water conservation practices with current El Niño Southern Oscillation (ENSO) models predicting weak to moderate El Niño conditions through to December 2018. Chief Hydrometeorological Officer (ag) Dr. Garvin Cummings, according to the Ministry of Agriculture is therefore, advising persons, especially farmers, to conserve water during the dry period. “The absence of rainfall does not indicate a drought situation, but rather a period of dry spells. As a consequence, citizens are advised to conserve water until the start of the secondary rainfall season at the end of the year. Areas in the Rupununi Savannahs that rely on shallow wells and small streams for their water supply should enforce strict water conservation and storage practices during this period as flooding from swollen streams and rivers due to heavy rainfall is unlikely during this period,” Dr. Cummings said. Additionally, persons are being encouraged to manage and closely monitor freshwater resources to ensure maximum efficiency, and cautioned persons to avoid emptying of conservancies during this period. According to surface analysis, the Inter-tropical Convergence Zone (ITCZ) has been meandering between 5º N and 8º N. Additionally, tropical waves are recorded as passing further to the north of Guyana. “These factors will continue to produce weak to moderate atmospheric instability over the country’s northern Regions (1 to 4). As the season progresses, these systems will cease to affect Guyana. Other areas of the country are currently being affected by mid-level troughs and localized conditions. The Hydromet Department said that it is encouraging the use of water troughs, where possible, to provide water for livestock during dry periods. Furthermore, during periods of downpours, techniques such as water harvesting should also be practiced as the probability of dry spells will increase during the season. While experiencing El Niño conditions, the average sea surface temperature across the Equatorial Pacific is above the climatological (long-term) average. Output from the Seasonal Climate Outlook model for September to November, 2018 suggests that Guyana will experience the usually dry conditions experienced during this time of the year. However, there are slightly higher chances for wetter than usual conditions for northern Guyana. Usually, northern Guyana would experience 15 to 32 rain days (days with more than 1 mm of rainfall) from September to October. The Hydromet Department further cautioned all stakeholders that while the country is transitioning into the dry season, there can still be periods of heavy downpours that can create the conditions for localized flooding. Persons desirous of information on short term forecasts and weather analyses are advised to follow the daily weather brief, outlooks and advisories produced by the National Weather Watch Centre or visit www.hydromet.gov.gy or contact the Forecast Desk on 261-2284/261-2216.